Check out this modern log home settled on the hilltop of a 140-acre farm with captivating views. This cape cod is equipped with central heat and air-conditioning as well as a soapstone wood stove to enjoy in the main living area. You will be amazed with the addition of the sun room that provides a second living area while highlighting a 180 degree vista from the windows. The house features three comfortable bedrooms. The first upstairs bedroom contains a king bed with a pack 'n play available if needed. The second upstairs bedroom has one queen bed and one twin bed as well as a desk and chair for working by the window view. Full bathrooms are located on both floors. The bunk room is on the main level providing a twin over full bunk bed along with a relaxing hammock chair! In addition to clean towels, sheets and soaps being provided, there is laundry access on the main floor for your convenience. The log home has a complete kitchen with new appliances and all the tools you will need to create meals onsite for your friends and family. Enjoy eating around the table (seats 8) or head out to the deck where mountain views and farm life will always be available to enjoy. At dusk you may want to take a stroll down the lane which runs through the ridge of the farm or as evening settles you may enjoy a small fire in the fire pit. 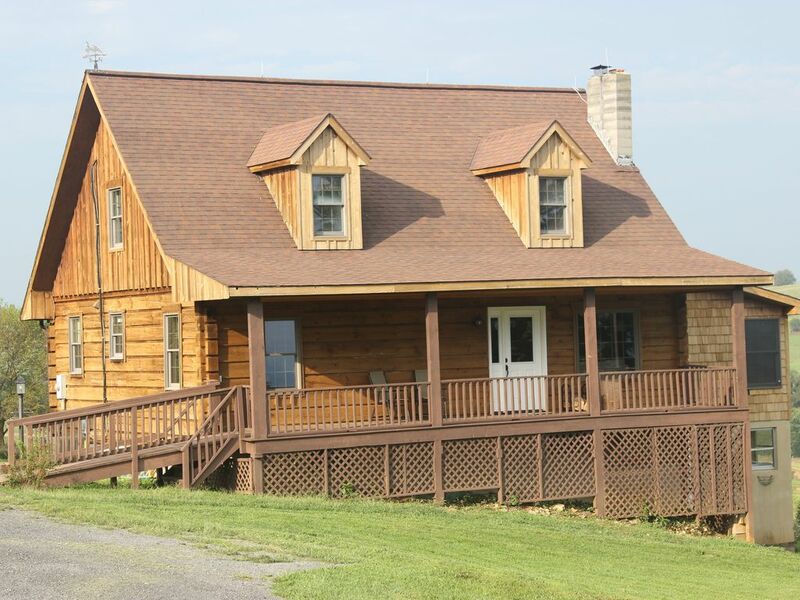 While enjoying the peace and quiet of country life, our chalet is located less than 10 minutes from interstate 81. We are five minutes from our small town with a few local eating and shopping options. You may stock up on supplies with an eight minute drive to grocery stores, pharmacy, and other shopping. While being surrounded by country life we are a mere 20 minutes from the city, complete with many popular and local shopping and dining choices. This city is the home of James Madison University, Bridgewater College and Eastern Mennonite University. Check out our extensive collection of brochures, highlighting nearby attractions ranging from caverns, national parks, specialty farms and farmers markets to wineries, historical sites, museums, and golf. For at home entertainment, the Log Inn is equipped with a WiFi hot spot, a television and DVD/Blu-ray player. We look forward to sharing our hospitality with you and are available to answer any questions you may have. I grew up on this farm and have worked it with my family all my life. There is not much more thrilling for me than spending time working with the animals, mowing and raking hay fields, and providing hospitality through hosting! Available for light browsing and checking email. Not available in large quantities for streaming. Paper towels, plastic wrap, foil, plastic baggies, basic spices, flour, sugar, coffee, tea, ketchup, mustard, vinegar, oil, cooking spray, water bottles. Ramp on porch to enter home. Full bath located on main level but not wheelchair designed. Full bed on main floor. A beautiful house, on a beautiful mountain. Perfect weekend getaway, thank you Grace. The house has a wonderful view of the valley from every angle. There was plenty of towels and miscellaneous supplies like shampoo and soap for all the guests who forgot their own. We were arriving so late that it was a little difficult to find in the dark, but were so pleased when we got there. Everybody enjoyed the house and the surroundings! It was very clean, roomy, and spacious! We will definitely return! Perfect gathering places—two living rooms, porch and deck. Quality bed linens, updated kitchen and laundry. Anticipating our upcoming return stay in June. My friends and I loved staying at the Log Inn. It was very big and very cozy, and the farm and mountain views are gorgeous. We really appreciated all the homey touches like the cute succulents and the very soft blankets. The kitchen was big and had everything we needed to cook on our own. Thank you Grace for being so responsive and helpful! The house was even nicer than expected. Beautiful views and very comfortable. Host were extremely helpful and very attentive hoping to come back again for a longer stay!